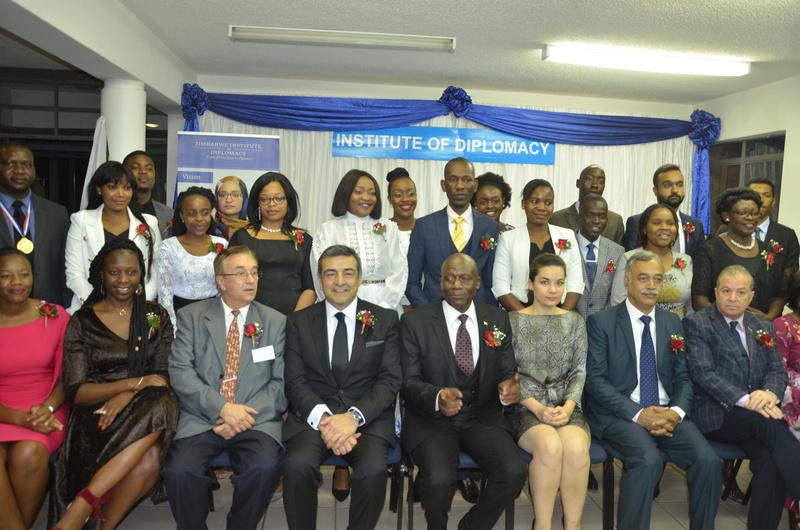 His Excellency Hakan Kivanc was the guest of honour at the Executive Certificate in Diplomacy, Protocol, Etiquette and Professional Branding Graduation. In his remarks his Excellency said that the students were lucky to graduate from the Institute of Diplomacy since they were polished and equipped with a new discipline. The chairperson of Zimbabwe Institute of Diplomacy, Mr V A Chikanda encouraged the Students to use the acquired knowledge and hold on their value system, work ethics and most importantly humanity. Protocol, Diplomacy, Business Etiquette, Grooming, Customer Care, Foreign Policy, Introduction to International Law, Introduction to international Relations, Negotiation, Event Management are some of the modules which were covered under the guise of this certificate. The graduation was graced by a representative of the embassy of Palestine and the Deputy Ambassador of Pakistan.